Andy Warhol to name a few. The building is composed of three floors and designed so you enter at the top via an escalator that is colored bright red. The exterior escalator and stair reminds one of Piano’s earlier works, the Centre George Pompidou. The top two floors show off the collection and keep the work in order by artist. When one reaches the ground floor, it is filled with two works by Richard Serra. 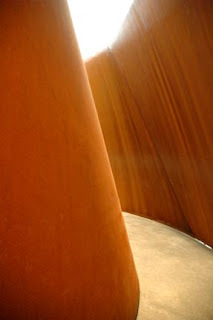 Serra’s work is impressive, huge, and just a plain treat for the senses. LACMA has also rearranged work in the other buildings on the campus. Many works of modern art have been moved to the Ahmanson building and are shown with a fresh vision. Don’t miss this part of LACMA. Congratulations are in order to LACMA and the staff. The BCAM is a success and the continued growth of LACMA is truly welcome. 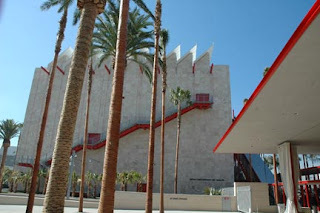 If you want to visit the BCAM and LACMA this week, it is FREE Feb. 16-18. 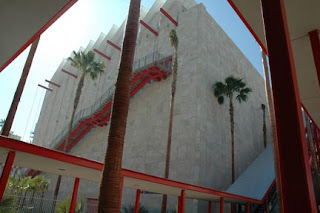 You will need to order dated and timed tickets at the LACMA site. Today marks Super Tuesday in the US. Today is our chance to change the future if you live in one of 24 voting states today. I reside in California so today marks our day to voice our vote. I hope you will vote whenever your primary is held and in November to elect our new president. 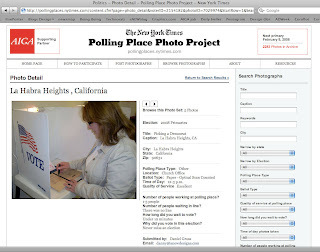 The New York Times along with the AIGA have a website to submit photos for your elections. It is a great way to share and show democracy in action. I submitted to the Polling Place Photo Project. I hope you will too.